The Renewable Energy of the Future is Here—Now! The energy of the future appears to be here now, today, in full force, in our everyday lives. Ideas that once seemed fantastically futuristic, such as all-electric cars, wind and solar power, and decentralized energy storage are becoming part of our everyday life, according to Clean Technica. 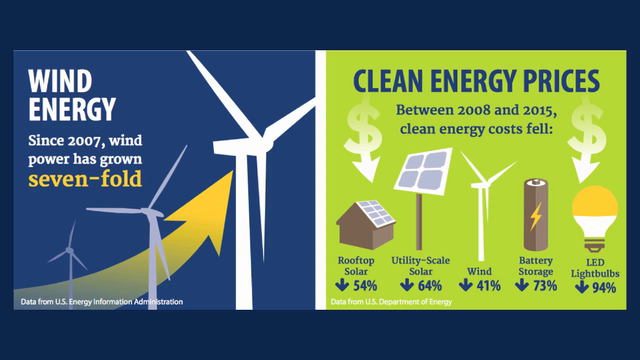 A recent report, “Renewables on the Rise: A Decade of Progress Toward a Clean Energy Future,” provides an overview of factors that have contributed to the rapid growth of clean, renewable energy in the last decade, including tech innovation, lower costs, and supportive policies. The report, by Environment New York: Research and Policy Center, in conjunction with Frontier Group, outlines a number of significant statistics that chart the rise of renewables. Among the highlights is the finding that today, the US produces nearly eight times as much renewable electricity from the sun and wind as in 2007. The report also contains this interesting fact: clean renewable energy is distributed fairly evenly across the US. Could this be one issue that unites this deeply polarized country? I’m John Howell for 3BL Media.